Literally termed as “Presidential Residence”, the Rashtrapati Bhavan is an enormous Mansion with 340 rooms, halls, Guest Rooms, Offices, Mughal Garden, Body Guard and Staff Quarters, Stables, Utilities, etc. The structure was built by two British Architects Edward Lutyens and Herbert Baker. The Heavy Classical Motifs reveals the power and regal imperium. The grilles were made out of red sandstones in Rajasthani design. Massive columns on east side were decorated with a mixture of Acanthus leaves and Indian Bells. 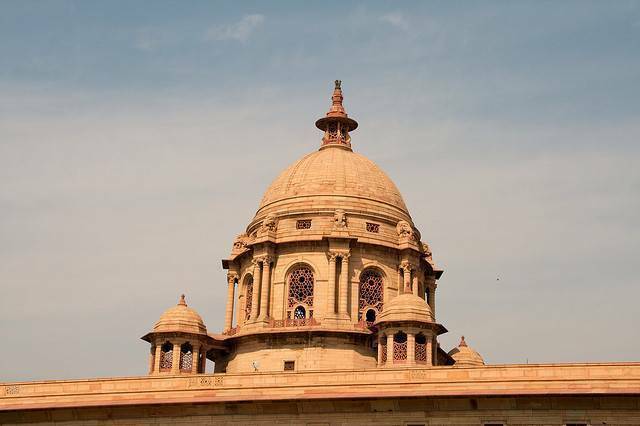 Dome of Rashtrapati Bhavan was highly inspired by Pantheon of Rome and it was a fusion of Indian and British Architecture. The Landscape Styling and Features of Mughal Garden on the Backyard of Rashtrapati Bhavan is a complete mixture of Mughal and British. Viewers get mesmerized, once they step inside the Purdha Garden, where 16 square Rose Beds welcomes you warmly. The horticultural Office, Green house etc comes around the Circular Garden. Public are allowed to visit the Mughal Garden during the month of February and March every year. Opens only from Friday to Sunday and permission is needed from the Government of India Tourist Office to visit Rashtrapati Bhavan. Best time to visit is in February and March when various flower shows are on and you can see colorful variety of flowers at the Mughal Gardens.